Speaking of adult beverages, I'm overdue in making a couple of suggestions about what to drink next time you're at TFB. Ok, admittedly that mostly involves me writing down the three or four things that wine director Betty Cole has gotten me really excited about lately. With that in mind, here are some wines that I think are showing exceptionally well and that you should come drink to escape SXSW. To paraphrase our dear friend Carenn Jackson, "Drink more Chenin, y'all!" Wait... maybe that was "always be drinking Chenin", or "if you don't love Chenin, you're stupid and have no taste?" Whatever. You get the idea. Chenin Blanc is an exceptional and diverse grape. Its ample acidity makes for some terrific food wines. (Wine Nerd alert: that acidity means many Chenins can benefit from cellaring for years, even decades). But regardless of age, Chenin Blanc yields a wide and diverse range of styles, from "off-dry" Vouvrays that retain a fair amount of residual sugar, to cutting, edgy, dry dry dry finish whites that somehow still retain amazing body and color. 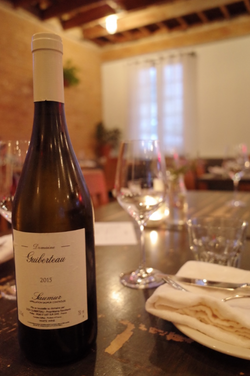 The 2015 Saumur Blanc on our list ($48) is on the dryer side and made by Romain Guiberteau, one of the more sought after producers currently making wine in the Loire Valley in northwestern France. (Wine Nerd alert #2: Romain learned wine making from Dani Foucault, maker of legendary cult Cabernet Franc, Clos Rougeard, also available at TFB.) The Guiberteau is assertive enough that you won't regret passing on a red. With a lovely medium body, terrific sharp acidity, and a harmoniously balanced finish, it will have you nodding your head in agreement with Carenn. I'd like to recommend two red wines that have won me over in recent weeks. The lighter bodied of these is a Pinot Noir from Burgundy (2013, $63) made by some French dude (Regis Bouvier) who makes some super fancy wine . Try and stay with me here. Pinot Noir - especially the French kind - tends to be a rather delicate affair, emphasizing balance and finesse over raw power. But on a recent Monday night - perhaps thinking I'd challenge the traditional wisdom, I took a bottle of this Bouvier over to Ruby's BBQ, sat down on their very pleasant patio with my lovely girlfriend and two of our three dogs (hey - it's a long story) for ribs, brisket and beans. Pinot and BBQ? It seemed worth a shot. The wine was nice, but seemed a bit unremarkable. I texted Betty a shot of the label, whereupon she immediately texted back in all caps "DID YOU DECANT?". Silly me, I hadn't. Lacking a decanter, I did what any good wine snob would do. I put my hand over the lip of the 2/3rds full bottle and gave her a good shake and sent the video to Betty. Well, that changed everything - the results were stunning. My spicy bbq baked beans were suddenly transformed into the Texas culinary equivalent of the finest French truck stop cassoulet when paired with this Marsannay Madness. Now onto my next recommendation. Say you're just not interested in a Pinot and want a bigger wine... you're looking for that muscle with your steak. I'm going to suggest you try the Crozes-Hermitage from winemaker Alain Graillot (2014, $72). The wines from the Crozes Hermitage region in southern France, a sub-region of the Cote du Rhone, are made from Syrah grapes. They tend to be sturdy and structured in a most appealing way. This wine will drink a bit bigger than the Pinot I mentioned above, with more to offer in the way of leathery tannins, chewiness and texture, and more restraint shown with fruit and acidity. But my response is the basically the same: I find myself turning the bottle over at the end, hoping there might be just one sip left. PS - Congratulations on your engagement, Carenn!